Sorry – I couldn’t help myself. 40 years and the data’re bordering on lost. Worrying, actually. This is fascinating. It’s a shame that we allow data storage like this to become obsolete and unreadable, and to slip through the cracks. I hope they’re successful in recovering it. It won’t be too long before nobody will be able to read MP3s and JPGs on CDs. Image the cost of having to convert the shear number of these files to the “new” format in 10 or 20 years! It makes one realize the benefit of having a hard copy on acid free paper. 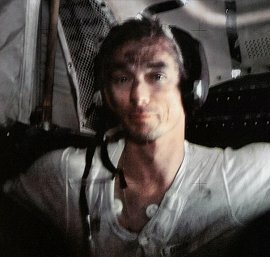 The picture of Gene Cernan shown above in the article is one of my most favourite pictures of manned spaceflight. Till to that moment it is the most heroic picture of a human who has crossed the last frontier. 1. Lose the backup tapes and the ability to read them..
What kind of “scientific” mindset is that? How much more data was lost because shortsighted people said “eh, who cares?” Sheer stupidity and a waste of taxpayer dollars. Thanks NASA. One of my jobs in the navy was repairing real to real tape drives. Granted they were late 60’s tech but nonetheless a freaking nightmare to maintain and keep operating. Much like the hard drives of the time… a rotating barrel based ferrous core memory system. Anyway, media was a constant problem… Anything past about eight years old turned un-uasable for either read or write (pariity check on the edges). They’d be better off, if they new the original machine code, to build something for a straight read of the tape and recompiling it. Still, if you don’t know what “F101A D110E” means in its original context, the data is still worthless. We didn’t have a scientific mindset because, pure and simple, it wasn’t a scientific mission. Science was certainly a justification, but the purpose of the mission was definitely national pride and technology demonstration. This type of problem is not only endemic to NASA, but is clearly a MAJOR problem within the realm of archiving data (especially expensive to obtain but no expense spared to maintain). I’ve also read that some data retrieved by the Viking landers in 1976-77 is now lost due to deterioration of the original magnetic tapes. NASA and other serious scientific repositories of such valuable info clearly need resources allocated to preserve, maintain, and access data collected and make sure future scientists can easily access this vast treasure trove of data. Without this intense effort to preserve data (from all sources), what good is collecting and storing this valuable info for future use? Did anyone ever do a study of what breathing in that lunar dust did to the astronauts’ lungs and health? Something else I think they will find rather important when building and living in a permanent lunar colony. I wonder if Mars dust is any “nicer”? Besides the fact that few probably even thought about or cared if Apollo-era data tapes could be read decades from then, I also get the feeling that since future manned lunar missions after Apollo 17 would not happen until the distant 21st Century, that by then new data would be gathered before a lunar colony was set up. Little did they know that lunar dust issues would not be taken seriously until a matter of years ago. Mars dust would be just fine and dandy, as dust goes, because it’s been blown around by the winds for a few 10e9 years and has nice, round edges. Moon dust hasn’t moved since whatever meteorite impact generated it. All the rough edges are still there, waiting to lodge in the cracks of your spacesuit like the stickerburrs growing on the edge of NASA Road 1 in Houston. Seriously, somebody ought to endow a chair at a major university for a field having to do with old, old data archives, obsolete I/O technology, and strategies for attempting to retrieve that data and convert it to modern formats. The histories of such data-sets, the original technologies used to store and read them, and later neglect of those archives would be fascinating, and provide a tremendous amount of new insights that cultural anthropologists could use in their studies of our modern high-tech culture. Has anyone tried to set up such studies anywhere? Among other things, universities teaching and studying such things could provide information of tremendous help to scientists and technicians trying to recover data from valuable archives in obsolte formats. I betcha the local ham radio guys could fix it. They probably built it! Back in the 70’s most of the “slipstick” brigade were hams too. Yet another story of data in transit going missing! Scary how often data is lost in transit or stolen! Now……. if we can likewise locate the missing Apollo 11 slow-scan television data tape reels. Finding those data reels would recreate the Apollo 11 moonwalk at a sharp picture quality level that only a couple dozen or so people on Earth were able to witness in 1969. Yael Dragwyla (November 11th, 2008 at 1:53 am) has the right idea. However, I do think that this falls within the mission of the National Archives and they should be designated and funded to get every available dataset and convert them to media which will last. Seem sensible to anyone? Well, somebody should be able to decode the tape. What if that were delivered to SETI, couldn’t they decode it if were from some ET? The data were stored with IBM recorders. I mean, isn’t IBM much bigger than NASA? NASA has a budget of $20 billion, but IBM has a business volume of $100 billion. How big is the staff of NASA? IBM employs about 400.000 people. If IBM has lost the capability to restore data recorded with IBM technology, then how could one expect that from the very smaller enterprise called NASA which competence lies on a completely different sector? Great question, it should be treated as an ET message. If we can’t decode this, what hope is there in decoding anything. First thing to know about these computers is that there was no operating system as people know them today… You loaded a bootstrap routine in various registers using parity/non-parity octal or hex commands in order to get things moving. Lotsa 1 and 0’s before it ran on its on, basic machine code function/data commands. I’m sure there are plenty of people who either still remember the days before compilers or could figure it out easy enough. Decoding would be based around the instruments used to collect the data. You’d have to know the engineering / specs and after that it would be fairly straight-forward. For instance, and assuming the data is digital, using nothing fancier than 16 bit hex machine code. The actual data would have been stored back with the instrument address, you just have to know the engineering of the instrument to figure out what D 0011 A10E translated to. dbdncr, I do not have the faintest idea what you are talking about, but if it would work that would be great. I’m afraid we’ll lose one heck-of-a lot of treasured data over the coming decades. As our propensity to archive and log every bit of information, overload eventually happens. Imagine all of the movie footage that is NOT used in the final edit, all of the revisions in novels or magazine stories that COULD be archived. Who determines how long to archive e-mail at businesses? When a probe is in transit from earth to (you name it), do we archive all of the bits transmitted during the voyage? When it’s time to purge, to sort the wheat from the chaff, WHO makes that decision? Who’d have imagined that NASA MOON DATA might get lost? But it’s happened! I must imagine that the ancient technology used to encode those tapes could be replicated with a suitable scanning head and some of our flexible analog amplifiers / digitizers. Afterall, the data on the tape is likely some sort of FSK structure, and decoding the actual data back into a series of 1’s and 0’s should be pretty easy, once the geometry of the recorded “image” is replicated. After that, the data should have a structure that can be reverse engineered by a pimply-faced hacker in seconds. I’m curious as to what we’ll learn from those tapes!